While we all love a good ombre, for those less daring or those looking for a change..there’s something new to fall in love with. Sombres! The break down is simple: Soft. Ombre. We love sombres for all reasons but they are a perfect transition from the light Summer to darker Fall hair. So read on blondes, brunettes and red heads because sombres do not discriminate! The sombre is a very soft, subtle color change from roots to ends. The top and the bottom color are not drastically different, as with the ombre. Brighter and higher pieces of lighter color around the face transition into heavier light shades at the ends. Blondes, your first… the blonde sombre usually consists of sandy, darker roots with a fade into a bright, pale blonde. The blonde sombre also looks great with golden or ashy tones. Brunettes. You have a lot of color range to work with. You can go as dark as you want on the roots…maybe a chocolatey, rich brown with carmel and honey colors running through it. Last but not least, red heads. 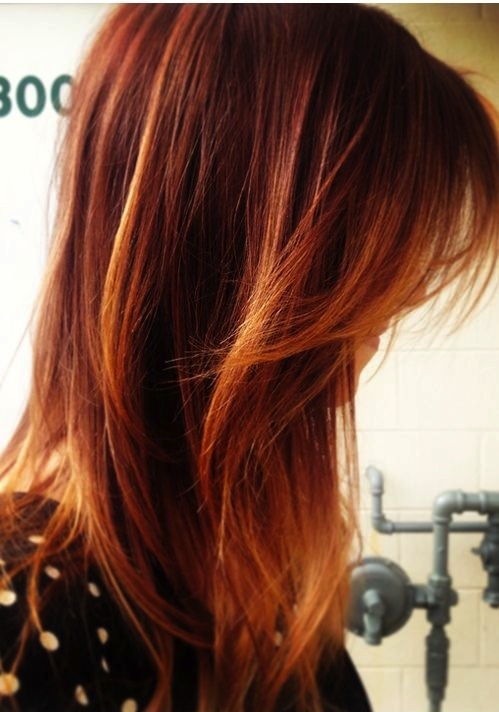 Your sombre would be more auburn or copper fading to a lighter golden, warm shade. Darker shades of red can fade into more sunkissed shades, still keeping it light on the bottom but giving that Fall look you are trying to transition to. Don’t like the upkeep? Don’t worry. Sombre’s are a great option for those of you who like low maintenance color. If you decide to stay somewhat close to your natural color, the outgrowth shouldn’t be too dramatic. This will give you less of a problem when those roots start coming in. As if we didn’t already give you enough reasons to fall in love with the sombre, it also enhances you texture and looks great with loose, wavy hair! You know, our fave… beachwaves! We love the look on long locks but our friends with short hair please don’t get discouraged…we also love it paired with our fave new Fall haircut the “lob” or long bob. And stay tuned for our post on that! Either way, the sombre is an amaze way to transition into Fall without losing all of your Summer brightness. We know it is difficult to part with all of the hard work you put into getting those perfectly blonded locks! If you are feeling extra good looking with your new sombre, we love love love it with all of the Fall dark lip colors, too! So stay tuned for more posts on all things Fall hair but until then think about that shiny, new sombre and call us to book today!